Question: Why would we need to center and ground ourselves if we are ascending? ~ We, as Spirit-Beings, have decided to incarnate into the Third Dimension to have an Earth Experience. How could we have a physical experience if we were not Third Dimensional? To move up and out of the physical body to ascend to another dimension means we have forsaken the prime directive. I feel we are to expand ourselves to accommodate higher frequencies while still holding to Third Dimensional Earth. Our bodies can morph or intertwine vibrations to become more than we are now. We have some of the most productive and amazing qualities as humans. And we are only using a small amount of the body/brain potential available to us. 1. Komara, a way of expanding consciousness without blowing apart. Keep your feet together and arms up in a “Y” shape. This opens you to other realms and higher information, such as communicating with your guides, etc. Then stand with your feet spread out at shoulder width and arms down to your sides. This grounds your spirit in the body, making it easier to maneuver on Earth. Use both positions to keep balanced. 2. Use earthing, or walking on the ground barefoot as a way to instantly ground your body to earth. If you are worn out and exhausted from a busy day, or communing with spirit, this brings your energy back asap. 3. Understand why events happen instead of getting caught up in the drama – perspective in all things. 4. Pieces of the higher realms are leaking into our third dimension. Find out where these things are leaking without your knowledge or permission and close them or welcome depending on what feels right for you. 5. Increase your energetic awareness. When you open up to intuitive concerns, you can feel information coming in. Pay attention to it. Know when it opens and when it closes. Be in control of that by putting your focus there. Balanced energy flows and resonates with well-being. Unbalanced energy leads to dis-ease. 6. Detect Energy from a Higher Vibration. By practicing as a lightworker, and being open to your psychic senses, you have a whole new dimension of consciousness. This is True Knowing in its highest sense. 7. Frequencies of Food, Medication, and Other Factors. In order to stay grounded be particular about the frequencies of the foods you eat. Food is fuel for the physical body. For example, you know what happens if you download a lot of useless information on your computer. It will crash. Cheaper fuel will cause a car to run inefficiently. Food with negative energy or lower vibrations tears down the physical body and opens it to disease. It can cause problems in your subtle body system, and slow down your evolution. Processed foods, additives, dyes, hormones, and medications can all be problems for your well being. This is the problem that the energy-sensitive Indigos ran into when they began to incarnate in Earth’s plane. Their sensitive systems were contaminated by foods that don’t resonate with their higher vibration. This is when many had reactions and health problems, such as attention deficit disorder (like an energy failure) and hyperactivity (like energy surges), leading to misdiagnosis and overmedication. Like the new Indigos, we as adult, hyper-sensitives, our bodies cannot hold the negative vibrations of all of the garbage going in. The “old system” can make us sick. Organic diets hold a much higher vibration and thus are better suited to the transforming body and evolving psychic senses. A high vibrational diet consists of foods that are ALIVE and that positively benefit the person, as well as the planet as a whole. High vibration means having more light, and thus less density. Consider trying a whole food one-day diet a week. See what it feels like. Keeping yourself grounded and aware of your own vibrations is the best way to achieve your ascension process and keeping centered. I’ve had many people recently ask me about psychic kids and seeing sparkles. So thought I’d remind everyone that my book “Does Your Child See Sparkles? 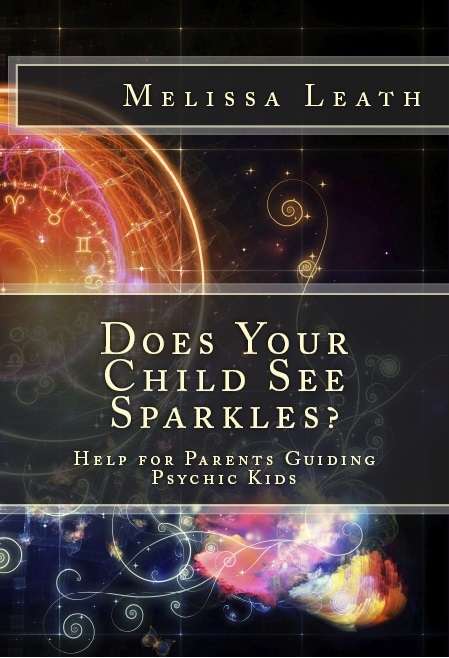 Help for Parents Guiding Psychic Kids” is being used by so many parents and teachers. Not only people with psychic kids, but especially by grown folks that remember having challenges as children. Empathic and psychic children are seeing things: Sparkles, Orbs, Spirits, and Ghosts. What is a parent to do? Don’t worry; Melissa Leath has it covered. She has been asked by parents about Sparkles (as the kids call them). And she has gone on a quest to find the answers. This book covers spirit energies, auras, subtle bodies, hyper-sensitive and empathic children and information on indigo and crystal children. There are excerpts from blog articles that started the search for the meaning of Sparkles, along with some of the comments that followed. Within this book, Melissa uncovers the concept of Sparkles, spirit lights, and other paranormal occurrences and visions seen by children. Are they apparitions or true experiences? Included are exercises to practice with your child, examples to help expand their ability in a healthy and empowering way, and ideas to implement in your families’ daily routine. “Sparkles” is filled with real life experiences from parents and their children; their fears and victories, along with Leath’s shared knowledge and explanations.